This is technically from yesterday, but you'll forgive me right? I can't seem to keep up with the dessert posts with M. still away. 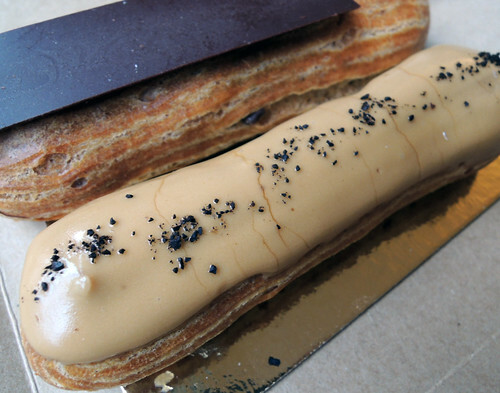 But I had to share these delicious eclairs from the bakery at newly opened French eatery, Lafayette. Andrew Carmellini seems to have no shortage of funds for new restaurants, the old Chinatown Brasserie has been so thoroughly eradicated, the space completely revamped to his style of upscale interior. John got me the birthday eclairs, whose chocolate interior was pleasantly bitter.